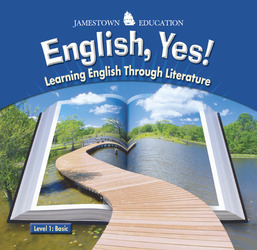 Unlike other English language programs, English, Yes! uses multicultural literature as the foundation for improving comprehension, vocabulary, grammar, and writing. Adapted selections from classic and contemporary authors of many cultures engage students in learning English. Cooperative learning activities based on the selections encourage readers to improve their writing, listening, and speaking skills. REVISED! New edition includes unit openers focusing on important pre-reading skills, such as activating prior knowledge and building background. REVISED! New Basic (level one) book includes survival skills for secondary students to navigate through the school and the community. New poems and songs are included in unit openers. REVISED! New Introductory (level two) book includes new selections with authors from around the world. REVISED! New audio CDs available with all selections model good oral language fluency. Multicultural literature engages the English language learner. Engaging narratives from Alma Flor ADA, Jack London, Lin Yutang, Maya Angelou, Manuela Williams Crosno, O. Henry, Saki, Langston Hughes, Edgar Allan Poe and many more. Folktalkes, stories, and legends from Vietnam, Africa, Russia, China, Spain, Finland, America, and beyond. Flexible teacher guides available, with options to meet your students' needs. Instructional design accomodates both independent and cooperative learning. Self-scoring activities promote accountability, while group activites help students improve their speaking, listening and writing skills. Activities in the Teacher Guides include graphic organizers, teacher modeling, and conventions of print, and more. Placement tests help students start at an appropriate level.